Q. I'm Trying To Lose Some Fat, But Everywhere I Go To Look For Helpful Information, I Get Conflicting Views On The Proper Macronutrient Ratio. Is There A Right Answer? Great question! In reality, when you're trying to lose weight, there's no ironclad macronutrient law for mapping out your diet plan. No macro mix can save you if you eat way too many calories or way too few. Yet your macro mix is an important consideration. Your body type, metabolism and weekly physical activity level all have some bearing on your ideal percentages for that moment in time. But that doesn't mean it will be the macronutrient ratio you'll use forever. It may change if and when your body weight or body fat fluctuates, or if you run into any plateaus. Then there's the fact that you have to continuously manipulate your ratios throughout any fat-loss plan. The macronutrient ratio I typically play with for maintenance purposes is 50% protein, 35% carbs and 15% fats. But that's for me. I need to stay lean all year round. That ratio won't necessarily work for you because you have a different body type, fitness goal and activity level. My body type is an ecto-mesomorph, which means it has a higher tolerance for carbs than most people. Even if I increase my carbs to 40-to-50 percent, I won't suffer. Not everybody is like that. Individuals who are carb-sensitive have to monitor their carbs closely and make adjustments in their ratios. Ectomorph: If you're an ectomorph, you're naturally thin with skinny limbs and a high tolerance for carbohydrates. Usually, your metabolic rate is fast. 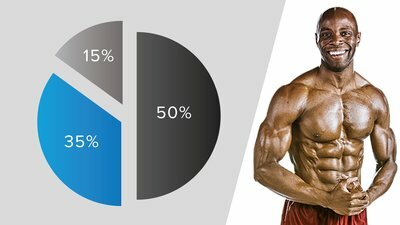 A good starting macronutrient ratio for you would be something like 25% protein, 55% carbs and 20% fat. Endomorph: If you're naturally broad and thick, you're probably an endomorph. Endomorphs have a low carbohydrate tolerance and a slow metabolic rate. If you're an endomorph, try a ratio of 35% protein, 25% carbs and 40% fat. Don't let your body type be an excuse for not reaching your goals. If you're an endomorph and have a difficult time leaning out, or are an ectomorph and can't seem to gain weight, don't give up. You can beat your biology; you just need to put some serious work into doing it. You need to want it bad enough. Bottom Line: These ratios are a starting range for most body-types, but don't be afraid to experiment for better results. Sometimes, decreasing your carbs and increasing your good fats can show remarkable fat-loss results. Get to know your body!